Computational geometry deals with algorithms and their implementations for manipulating geometrical objects. Although being a young area of geometry, it has many applications in computer vision, image processing, computer-aided design, medical imaging, etc. Where the traditional geometry allowed dimensions 1 (a line), 2 (a plane) and 3 (our ambient world conceived of as three-dimensional space), mathematicians have used higher dimensions for nearly two centuries. The concept of dimension has gone through stages of being any natural number n, to being possibly infinite with the introduction of Hilbert space, to being any positive real number in fractal geometry. Dimension theory is a technical area, initially within general topology, that discusses definitions; in common with most mathematical ideas, dimension is now defined rather than an intuition. Connected topological manifolds have a well-defined dimension; this is a theorem (invariance of domain) rather than anything a priori. The issue of dimension still matters to geometry as many classic questions still lack complete answers. For instance, many open problems in topology depend on the dimension of an object for the result. In physics, dimensions 3 of space and 4 of space-time are special cases in geometric topology, and dimensions 10 and 11 are key ideas in string theory. Currently, the existence of the theoretical dimensions is purely defined by technical reasons; it is likely that further research may result in a geometric reason for the significance of 10 or 11 dimensions in the theory, lending credibility or possibly disproving string theory. The theme of symmetry in geometry is nearly as old as the science of geometry itself. Symmetric shapes such as the circle, regular polygons and platonic solids held deep significance for many ancient philosophers and were investigated in detail before the time of Euclid. Symmetric patterns occur in nature and were artistically rendered in a multitude of forms, including the graphics of M.C. Escher. Nonetheless, it was not until the second half of 19th century that the unifying role of symmetry in foundations of geometry was recognized. Felix Klein's Erlangen program proclaimed that, in a very precise sense, symmetry, expressed via the notion of a transformation group, determines what geometry is. Symmetry in classical Euclidean geometry is represented by congruences and rigid motions, whereas in projective geometry an analogous role is played by collineations, geometric transformations that take straight lines into straight lines. However it was in the new geometries of Bolyai and Lobachevsky, Riemann, Clifford and Klein, and Sophus Lie that Klein's idea to 'define a geometry via its symmetry group' proved most influential. Both discrete and continuous symmetries play prominent roles in geometry, the former in topology and geometric group theory, the latter in Lie theory and Riemannian geometry. Differential geometry uses tools from calculus to study problems involving curvature. The 421polytope, orthogonally projected into the E8 Lie group Coxeter plane. Lie groups have several applications in physics. 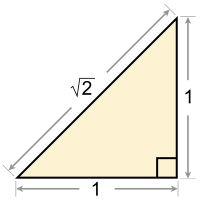 The Pythagoreans discovered that the sides of a triangle could have incommensurable lengths. ^ a b O'Connor, John J.; Robertson, Edmund F., "Al-Sabi Thabit ibn Qurra al-Harrani", MacTutor History of Mathematics archive, University of St Andrews . ^ Lamb, Evelyn (2015-11-08). "By Solving the Mysteries of Shape-Shifting Spaces, Mathematician Wins $3-Million Prize". Scientific American. Retrieved 2016-08-29. ^ a b Tabak, John (2014). Geometry: the language of space and form. Infobase Publishing. p. xiv. ISBN 978-0816049530. ^ a b Schmidt, W., Houang, R., & Cogan, L. (2002). "A coherent curriculum". American Educator, 26(2), 1–18. ^ Neugebauer, Otto (1969) . The Exact Sciences in Antiquity (2 ed.). Dover Publications. ISBN 978-0-486-22332-2. Chap. IV "Egyptian Mathematics and Astronomy", pp. 71–96. ^ Ossendrijver, Mathieu (29 Jan 2016). "Ancient Babylonian astronomers calculated Jupiter's position from the area under a time-velocity graph". Science. 351 (6272): 482–484. Bibcode:2016Sci...351..482O. doi:10.1126/science.aad8085. PMID 26823423. Retrieved 29 January 2016. ^ Depuydt, Leo (1 January 1998). "Gnomons at Meroë and Early Trigonometry". The Journal of Egyptian Archaeology. 84: 171–180. doi:10.2307/3822211. JSTOR 3822211. ^ Slayman, Andrew (May 27, 1998). "Neolithic Skywatchers". Archaeology Magazine Archive. ^ James R. Choike (1980). "The Pentagram and the Discovery of an Irrational Number". The Two-Year College Mathematics Journal. ^ O'Connor, J.J.; Robertson, E.F. (February 1996). "A history of calculus". University of St Andrews. Retrieved 2007-08-07. ^ Boyer (1991). "The Arabic Hegemony". A History of Mathematics. pp. 241–242. Omar Khayyam (c. 1050–1123), the "tent-maker," wrote an Algebra that went beyond that of al-Khwarizmi to include equations of third degree. Like his Arab predecessors, Omar Khayyam provided for quadratic equations both arithmetic and geometric solutions; for general cubic equations, he believed (mistakenly, as the 16th century later showed), arithmetic solutions were impossible; hence he gave only geometric solutions. The scheme of using intersecting conics to solve cubics had been used earlier by Menaechmus, Archimedes, and Alhazan, but Omar Khayyam took the praiseworthy step of generalizing the method to cover all third-degree equations (having positive roots). .. For equations of higher degree than three, Omar Khayyam evidently did not envision similar geometric methods, for space does not contain more than three dimensions, ... One of the most fruitful contributions of Arabic eclecticism was the tendency to close the gap between numerical and geometric algebra. The decisive step in this direction came much later with Descartes, but Omar Khayyam was moving in this direction when he wrote, "Whoever thinks algebra is a trick in obtaining unknowns has thought it in vain. No attention should be paid to the fact that algebra and geometry are different in appearance. Algebras are geometric facts which are proved." ^ O'Connor, John J.; Robertson, Edmund F., "Al-Mahani", MacTutor History of Mathematics archive, University of St Andrews . ^ O'Connor, John J.; Robertson, Edmund F., "Omar Khayyam", MacTutor History of Mathematics archive, University of St Andrews . Three scientists, Ibn al-Haytham, Khayyam, and al-Tusi, had made the most considerable contribution to this branch of geometry whose importance came to be completely recognized only in the 19th century. 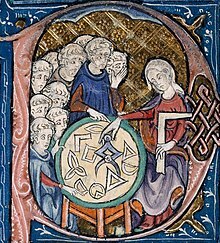 In essence, their propositions concerning the properties of quadrangles which they considered, assuming that some of the angles of these figures were acute of obtuse, embodied the first few theorems of the hyperbolic and the elliptic geometries. Their other proposals showed that various geometric statements were equivalent to the Euclidean postulate V. It is extremely important that these scholars established the mutual connection between this postulate and the sum of the angles of a triangle and a quadrangle. By their works on the theory of parallel lines Arab mathematicians directly influenced the relevant investigations of their European counterparts. The first European attempt to prove the postulate on parallel lines – made by Witelo, the Polish scientists of the 13th century, while revising Ibn al-Haytham's Book of Optics (Kitab al-Manazir) – was undoubtedly prompted by Arabic sources. The proofs put forward in the 14th century by the Jewish scholar Levi ben Gerson, who lived in southern France, and by the above-mentioned Alfonso from Spain directly border on Ibn al-Haytham's demonstration. Above, we have demonstrated that Pseudo-Tusi's Exposition of Euclid had stimulated both J. Wallis's and G. Saccheri's studies of the theory of parallel lines. ^ a b c d e Euclid's Elements – All thirteen books in one volume, Based on Heath's translation, Green Lion Press ISBN 1-888009-18-7. ^ Clark, Bowman L. (Jan 1985). "Individuals and Points". Notre Dame Journal of Formal Logic. 26 (1): 61–75. doi:10.1305/ndjfl/1093870761. Retrieved 29 August 2016. ^ Gerla, G., 1995, "Pointless Geometries" in Buekenhout, F., Kantor, W. eds., Handbook of incidence geometry: buildings and foundations. North-Holland: 1015–1031. ^ John Casey (1885) Analytic Geometry of the Point, Line, Circle, and Conic Sections, link from Internet Archive. ^ "geodesic – definition of geodesic in English from the Oxford dictionary". OxfordDictionaries.com. Retrieved 2016-01-20. ^ a b c d e Munkres, James R. Topology. Vol. 2. Upper Saddle River: Prentice Hall, 2000. ^ Ahlfors, Lars V. Complex analysis: an introduction to the theory of analytic functions of one complex variable. New York, London (1953). ^ Gelʹfand, Izrailʹ Moiseevič, and Mark Saul. "Trigonometry." 'Trigonometry'. Birkhäuser Boston, 2001. 1–20. ^ Jost, Jürgen (2002), Riemannian Geometry and Geometric Analysis, Berlin: Springer-Verlag, ISBN 978-3-540-42627-1 . ^ Baker, Henry Frederick. Principles of geometry. Vol. 2. CUP Archive, 1954. ^ a b c Do Carmo, Manfredo Perdigao, and Manfredo Perdigao Do Carmo. Differential geometry of curves and surfaces. Vol. 2. Englewood Cliffs: Prentice-hall, 1976. ^ a b Mumford, David (1999). The Red Book of Varieties and Schemes Includes the Michigan Lectures on Curves and Their Jacobians (2nd ed.). Springer-Verlag. ISBN 978-3-540-63293-1. Zbl 0945.14001. ^ Briggs, William L., and Lyle Cochran Calculus. "Early Transcendentals." ISBN 978-0321570567. ^ Yau, Shing-Tung; Nadis, Steve (2010). The Shape of Inner Space: String Theory and the Geometry of the Universe's Hidden Dimensions. Basic Books. ISBN 978-0-465-02023-2. ^ Dmitri Burago, Yu D Burago, Sergei Ivanov, A Course in Metric Geometry, American Mathematical Society, 2001, ISBN 0-8218-2129-6. ^ Kline (1972) "Mathematical thought from ancient to modern times", Oxford University Press, p. 1032. Kant did not reject the logical (analytic a priori) possibility of non-Euclidean geometry, see Jeremy Gray, "Ideas of Space Euclidean, Non-Euclidean, and Relativistic", Oxford, 1989; p. 85. Some have implied that, in light of this, Kant had in fact predicted the development of non-Euclidean geometry, cf. Leonard Nelson, "Philosophy and Axiomatics," Socratic Method and Critical Philosophy, Dover, 1965, p. 164. ^ "Ueber die Hypothesen, welche der Geometrie zu Grunde liegen". Archived from the original on 18 March 2016. ^ It is quite common in algebraic geometry to speak about geometry of algebraic varieties over finite fields, possibly singular. From a naïve perspective, these objects are just finite sets of points, but by invoking powerful geometric imagery and using well developed geometric techniques, it is possible to find structure and establish properties that make them somewhat analogous to the ordinary spheres or cones. Boyer, C.B. (1991) . A History of Mathematics (Second edition, revised by Uta C. Merzbach ed.). New York: Wiley. ISBN 978-0-471-54397-8.